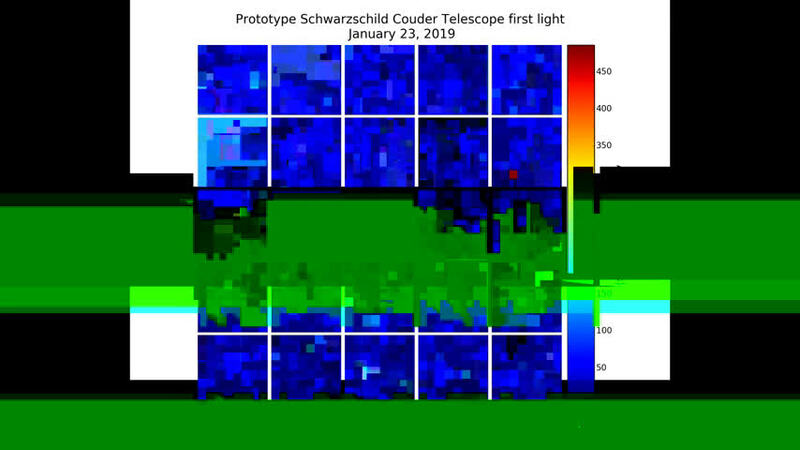 Less than a week after its inauguration on 17 January 2019, the prototype Schwarzschild-Couder Telescope (pSCT), a prototype telescope proposed for the Cherenkov Telescope Array (CTA), successfully detected its first Cherenkov light on January 23 at the Fred Lawrence Whipple Observatory in Arizona. A dual-mirrored Medium-Sized Telescope, the SCT is proposed to cover the middle of CTA's energy range (80 GeV – 50 TeV). The week following the inauguration, the camera was operated for the first time with the mirrors uncovered in a commissioning test run. During the first few minutes of this "first light" run on the evening of January 23, cosmic-ray-induced Cherenkov air shower events were identified in the raw, uncalibrated camera data. The attached video shows 50 nanoseconds of a single event in which the Cherenkov air shower development is recorded by the camera with one nanosecond resolution (time between video frames). Cherenkov light is the result of a gamma ray or cosmic ray from an astrophysical source interacting with the Earth's atmosphere. The flash of bluish light only lasts a few billionths of a second and is extremely faint. Gamma-ray telescope cameras are sensitive to these faint flashes. The pSCT camera triggers when several neighboring pixels detect light within a few nanoseconds of one another. The camera has a modular design, with 25 modules each containing 64 pixels. 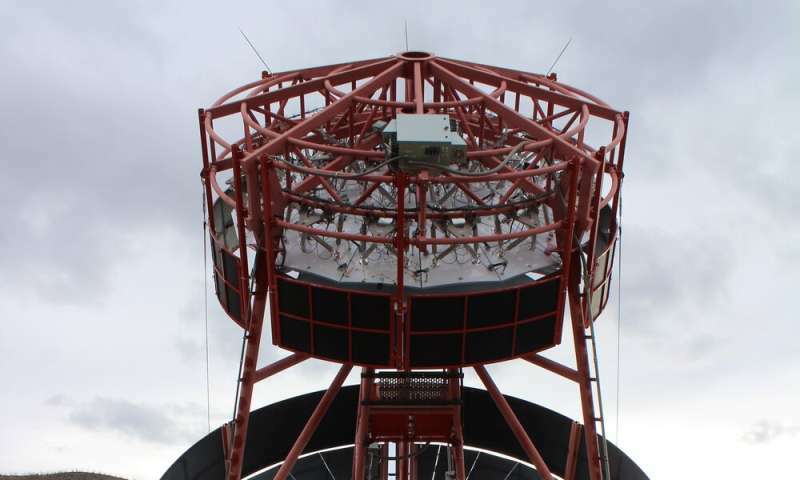 The central module is not yet installed in order to shine a laser beam along the central axis for telescope alignment, and a neighboring module was disabled during the test run. The pixel amplitudes are raw and uncalibrated, but the early results are a major milestone for the SCT team. The SCT's dual-mirror optical system improves on the single-mirror designs traditionally used in gamma-ray telescopes by dramatically enhancing the optical quality of their focused light over a large region of the sky and by enabling the use of compact, highly-efficient photo-sensors in the telescope camera. The pSCT commissioning will continue in 2019, including alignment of the mirror panels of both the primary and secondary mirror, positioning of the camera with respect to the focal plane and calibration of the camera data. A project is underway to increase the number of pixels in the pSCT camera by a factor of seven in order to match the wide field of view of the mirrors. CTA will consist of 118 telescopes split between a southern array in Paranal, Chile and a northern array on the island of La Palma, Spain. Three classes of telescopes (Small-, Medium- and Large-Sized Telescopes) will be used to detect gamma rays in the energy range 20 GeV to 300 TeV with about ten times increased sensitivity compared to any current observatory. Notable for providing improved gamma-ray angular resolution and its very-high-resolution camera (>11,000 pixels), the SCT is proposed for the medium-sized CTA telescopes, which are considered to be the "workhorses" of the arrays with 15 planned for the north site and 25 for the south site. More information: More about the SCT.